Temperature : Max. 35°C and Min. 22°C in Summer. Max. 33°C and Min. 20°C in Winter. 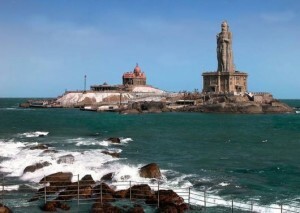 Kanniyakumari is the southern most point of peninsular India. It is the meeting point of the three oceans – the Bay of Bengal, the Arabian Sea and the Indian Ocean. Besides its important at the pilgrim centre, it is famous for its beautiful views of sunrise, sunset and moonrise over the waters. Palaces to see are the Kumari Amman Temple, Gandhi Memorial, Kanniyakumari Temple, the beach and the Vivekananda Memorial. Nearby excursion includes Sechindram Temple with musical pillars at a distance of 13 km, the palace and museum at Padmanadhapuram is 32 km away, the circular fort at Vattakottai is located 6 km away and the Nagaraja Temple and Nagercoin at a distance of 19 km. Air: Nearest airport is Thiruvananthapuram situated at a distance of 80 km is directly connected with Channai, Kochi, Delhi, Bangalore, Mumbai by Indian Airlines. Rail: Kanniyakumari is directly connected with major cities of India. Road: Kanniyakumari is connected by road with Thiruvananthapuram, Rameshwaram, Madurai, Coimbatore, Dindugal, etc. This entry was posted in Kanniyakumari, Tamil Nadu. Bookmark the permalink.